Travel Media Group has helped the Floridian Express hotel consistently improve their online reputation. Strategic reputation solutions have helped increase positive traveler reviews while managing negative feedback privately. In just six months, the Floridian Express hotel has earned 1,708 new TripAdvisor reviews, leading to a gain of 98 in overall city rank. Update: As of November 2018, The Floridian Express has gained 110 places in TripAdvisor city rank. 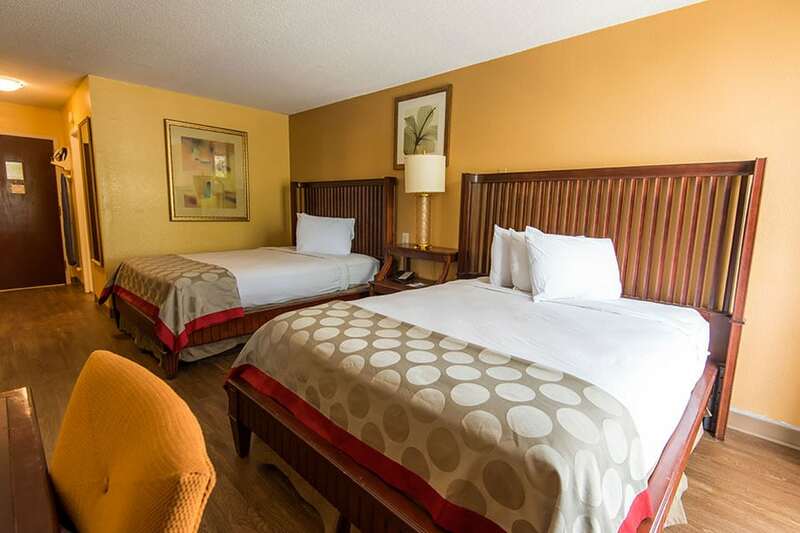 The Floridian Express hotel is an economy hotel located in a prime location on Orlando’s International Drive. In a market with immense competition, the Floridian Express stands apart with free parking and theme park shuttles, free breakfast, complimentary Wi-Fi, a pool, and competitive rates. While the Floridian Express offers an exceptional value for travelers visiting parks like Universal Studios and SeaWorld, they suffered from an imbalance of positive and negative feedback. Unhappy guests were leaving public reviews after they stayed, while happy guests were simply checking out. This lead to the hotel falling behind their competition, to #287 of 349 Orlando hotels on TripAdvisor. When travelers are choosing between hotels in this in-demand area, reviews can be the make-or-break decision point. It was apparent that the hotel needed to proactively manage their reputation instead of leaving it to chance. When the Floridian Express began working with Travel Media Group, they hoped to rise by 30 spots on TripAdvisor. Plus, at the time, only 24% of their reviews were positive. That means that they could be missing out on vital revenue from guests choosing their competitors. After all, when comparing two hotels at the same price, 60% of travelers will choose the hotel with a higher review score. We focused on increasing the number of positive reviews from happy guests while providing the Floridian Express with constructive feedback from unhappy guests through internal surveys. Because of their convenient location, the Floridian Express has a high level of guest turnover. There was so much opportunity to help them increase their reputation online by just tapping into the experiences of their customers. Here’s how they used Travel Media Group’s Tracking and Influence solutions to build their reputation. 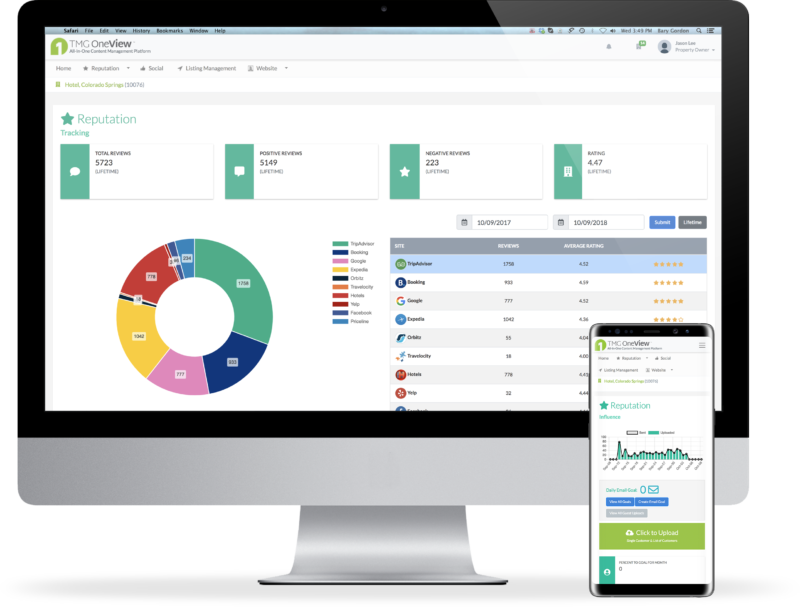 The Tracking dashboard automatically pulls in reviews received on TripAdvisor, Google, Yelp, Booking, Hotels.com, Orbitz and more. They could see exactly how many positive, negative, and neutral reviews they were receiving in real time. In addition, our hoteliers identify their 5 key competitors to understand their position in the marketplace at any time. This reporting enabled the Floridian Express to set goals for the quantity and quality of reviews needed to surpass their closest competitors. Next, the Floridian Express participated in our Influence program, which engages guests post-stay and encourages positive reviews online. By collecting negative feedback on internal surveys, the hotel was given the opportunity to connect with the disappointed guests directly and provide elevated customer service. Through this program, in just six months we referred more than 1,700 happy guests to review websites while collecting internal feedback from 300 guests who reported a negative experience. This internal feedback system allowed managers of Floridian Express to better understand negative experiences and address them, without broadcasting them to future travelers online. Through our Reputation Influence solution, Travel Media Group referred more than 1,700 happy guests to review websites like TripAdvisor. Floridian Express can view all data from TripAdvisor, Google, OTAs and more for the property and their top 5 competitors. This enables them to understand their position in the marketplace in real time. Happy guests that before were not engaging online are now encouraged to leave online reviews. Partnering with Travel Media Group was the best decision we made starting 2018. Their reputation management program is amazing! It helped us surpass our goals for the year only in 6 months. We jumped a hundred positions on TripAdvisor thanks to their support and coaching. In general, the experience with Travel Media Group has been extraordinary. Through Tracking and Influence, Floridian Express achieved significant positive results for their online reputation.